This is a series of blog posts intended to be an accurate and unbiased discussion of sports field construction and maintenance costs for high performance natural grass athletic fields as compared to synthetic turf. Most comparative data that has been published and ultimately used in athletic field purchasing decisions in recent years is dramatically slanted by the synthetic turf manufacturers and/or construction companies. Decision makers in many organizations, like public school districts, are often told there is no choice in the matter when deciding how to spend their sports field dollars. All too often, when considering natural grass versus synthetic turf the only decision being offered is to install a synthetic turf field; forcing organizations, and their taxpayers, to take on more debt to pay for something that - in almost all situations - is not needed. It’s ironic that as public school administrators are attempting to deal with the real world effects of a weak economy and lower revenues, more and more money is being spent on synthetic turf field installations. 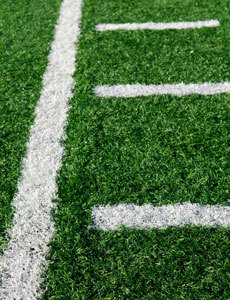 To be clear, there are legitimate reasons for choosing to install a synthetic turf sports field. Cost is NOT one of these reasons; and yet, a vast amount of misinformation about natural grass and synthetic turf costs is readily available to try and justify the selection of a synthetic turf playing surface. In the most extreme cases, school athletic departments are coached to worsen the condition of their current natural grass field by purposefully increasing the amount of foot traffic on the field every day to try to make a better public case for synthetic turf. 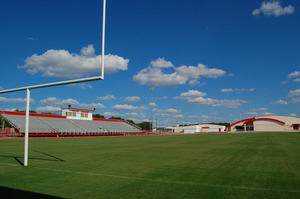 Tactics such as allowing more time for band practice on the field; opening up the field to more city youth sports organizations and events; and reducing any existing maintenance efforts on the field are used in an attempt to help persuade people that the current natural grass field should be eliminated. Because the cost differences between natural grass and synthetic sports turf are so great, it’s important that the people faced with making athletic field purchasing decisions have as much factual information available to them as possible. The information provided here is based largely on our company’s experience and knowledge acquired while building, renovating, and maintaining hundreds of quality natural grass sports fields all over Texas for more than 25 years. Customer interviews were also conducted to document the maintenance practices and costs for organizations responsible for managing synthetic turf fields in use today. The following figure is a breakdown of the various costs associated with the construction and yearly maintenance efforts involved in a high performance natural grass athletic field (football) compared to a typical synthetic turf sports field. Future posts in this series will look at the various individual costs associated with each item.